Luke and Beth Wilkinson are looking forward to Agri Expo kicked off their winter show season. Wendy Short went to meet them in North Yorkshire. 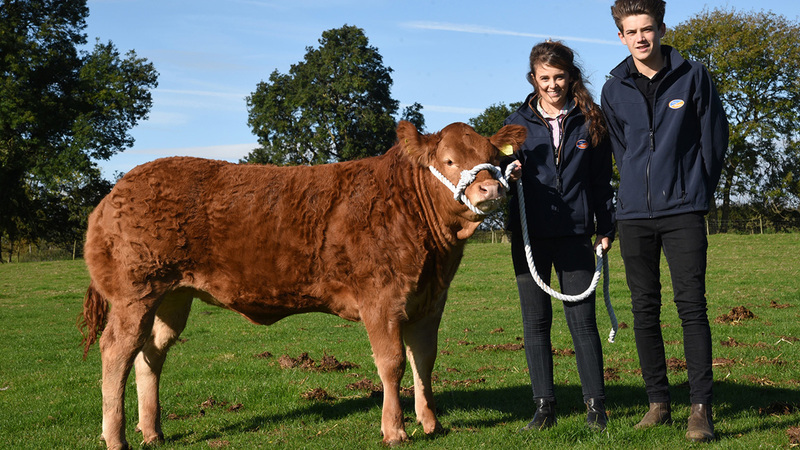 Commercial cattle showing is a family affair for North Yorkshire-based brother and sister, Luke and Beth Wilkinson. They have already achieved considerable success on the highly competitive circuit and will be taking a team of mainly Limousin cross British Blues to this year’s Agri-Expo. 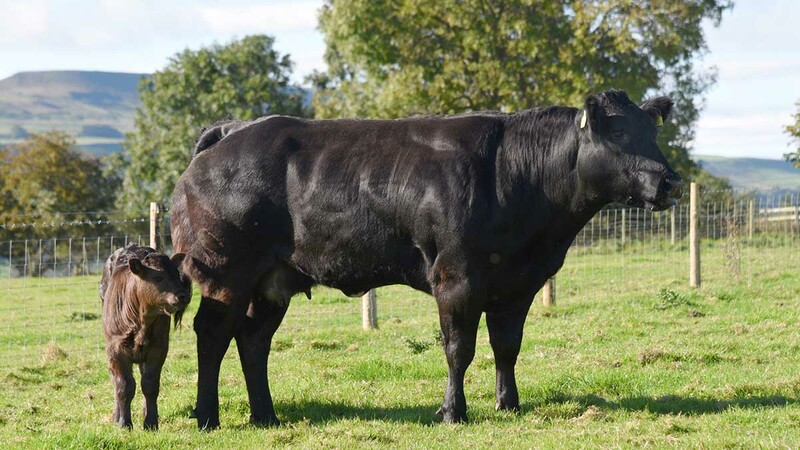 Luke was only three years old and his sister Beth five when they acquired their first commercial show calves, named Limousin Luke and Bluebell Beth. Now aged 16 and 18 respectively, their enthusiasm has remained undiminished and a couple of years ago they teamed up with their aunt and uncle, Jackie and Rob Marwood, who run a commercial beef and sheep farm. Luke and Beth’s grandfather farmed at Leyburn and their father, Jimmy, a farm worker and another keen commercial cattle showman, has retained 8 hectares (20 acres) and a large building just outside the market town. The family is most proud of the home-bred show progeny from the 20-cow British Limousin and British Blue suckler herd, although potential show calves are occasionally bought in. Luke singles out a heifer called Millie for special mention. He says: “We picked out our original Millie as a calf from B.R. Lawson and Son’s herd at Whashton, near Richmond. She was shown for a year and won a lot of rosettes for us, also producing two good calves. Unfortunately, she had to have a caesarean for her third calf and that led to an infection and we lost her. “Beth and I had to hand-rear her heifer calf, which we also named Millie, and she has turned out to be the best show animal we have ever had. She had her first outing at when she was just three months old and won the calf championship at Wensleydale, our local show. British Blue cow Americano, Baby Beef champion at Countryside Live 2015, with her heifer calf. All of the prize money earned by the commercial cattle showing enterprise goes back into the “pot”, although the brother and sister used their own savings to buy the partnership’s first pedigree animal, Garnedd Model, from Welsh Limousin breeders, K. and E. Jones of Bryn Ddraenan, Gwynedd. The 12-month-old heifer, by Truman Idol topped the February sale at Ruthin at 4,600gns and was bought jointly with John Smith-Jackson, another noted cattle breeder who is based at Haltwhistle, Northumberland. Beth and Luke’s reputation for presenting a well-behaved show animal in its best light has not gone unnoticed, and they also show animals on behalf of other farmers, including Mr Smith-Jackson and Robert Miller of Northern Ireland. “We spend a lot of time on preparation. Our cattle are washed thoroughly the weekend before the event, again during midweek and a third time on the morning of the show. The Wilkinson family was instrumental in establishing the annual Spring Spectacular event for commercial cattle with show potential. Held in March, it is hosted by Leyburn auction mart and is now in its 11th year. Luke is also a keen footballer and says he was torn between studying agriculture at the local Askham Bryan College and pursuing a career in sport. Meanwhile, Beth works at a local accountancy firm and maintains her links with agriculture by focusing mainly on clients with farming businesses. She admits the show cattle do become pets and she is always hoping for a heifer calf, so that it can stay in the herd. But the suggestion that Luke and Beth will be lured away from showing cattle by more mainstream teenage pursuits prompts an extremely negative response. “Getting up very early in the morning is not a problem and most of our spare time is taken up with the herd. Beth and I have our moments, like all siblings, but we generally get on quite well,” says Luke. “All of the effort is worthwhile when we get comments that our cattle look well, or when we win a championship rosette. We develop a bond with our cattle and that makes it is a pleasure, rather than a chore, to go down and see them. “We are both fully committed to carry on breeding and showing our cattle and we have made a lot of friends on the circuit,” says Luke. “It is not just the show days that we enjoy. We like the preparation, whether it is washing, clipping or halter-training. The birth of one of our own calves is always exciting, because we never know whether it will go on to do well for us. The Wilkinsons’ small suckler herd calves from February to March, with AI occasionally used to speed up genetic progress. Fed on a simple diet of home-grown forage and concentrates. The cows and heifers are grazed over the summer on a parcel of rented land and come into the buildings for the winter. Calves which are not selected for showing are sold as seven or eight months old stores at Leyburn auction mart.